SMGB South Malabar Gramin Bank | Government Jobs | March 2011 | Recruitment Asst. Managers | Apply Online Up to: 11 April, 2011. 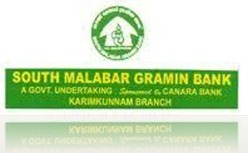 BE/ BTECH required in South Malabar Gramin Bank, Malappuram. South Malabar Gramin Bank sponsored by Canara Bank is one of the largest Regional Rural Banks (RRBs) in India in terms of total business. From humble beginnings in the year 1976, the bank has grown into a formidable financial institution, thanks to support of nearly two million of its customers ,mostly the common man. SMGB has over the years carved a niche in customer service and rural development . The bank is a pioneer in micro finance and lending to self help groups and have won several national and international accolades. Posted in Apply online, Bank job, Chemical, Civil, Computer Science, Construction Engineers, Control, Control and Instrumentation, Electrical, Electrical & Power, Electrical and Electronics, Electrochemical, Electronics and Communication, Electronics and Instrumentation, Electronics and Telecommunication, Government Job, Industrial, Instrumentation, IT, Job After Btech, Mechanical, Metallurgical, Mineral, Mining. Tags: 2011., Apply Online Up to: 11 April, Asst. Managers, Government Jobs, March 2011, recruitment, SMGB, South Malabar Gramin Bank on March 27, 2011 by kavita joshi.